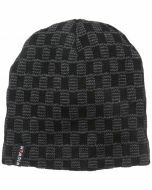 The Throwback Beanie acrylic knit hat is a beanie style hat with a striped design. It is supercharged to turn heads wherever you are. It is appropriate for either men or women. One size fits all. It features the softness, warmth and durability of acrylic fabric. This item is made in the USA and carries the wigwam quality.